In 1970, Elvis Presley (Michael Shannon) flies to Washington D.C. with the goal of convincing President Richard Nixon (Kevin Spacey) to deputize him as a federal agent-at-large. Showing up unannounced at the Northwest Gate of the White House with his buddy Jerry Schilling (Alex Pettyfer), Presley persuades awe-struck guards to hand deliver a letter to Nixon requesting a secret meeting. White House staffers Egil “Bud” Krogh (Colin Hanks) and Dwight Chapin (Evan Peters) tell the president that a sit-down with Elvis during an election year could generate good PR, but Nixon is in no mood to humor the legendary rocker. Undeterred, Jerry and Elvis’ sidekick Sonny (Johnny Knoxville) re-group with Krogh and Chapin to hatch a deal: Elvis will sign an autograph for Nixon’s daughter Julie in exchange for face time with the president. Prior to making his grand entrance, Presley is instructed in a litany of White House protocols, which he quickly disregards. To Nixon’s surprise and the astonishment of his nervous aides, the pair bond over their shared contempt of counterculture. 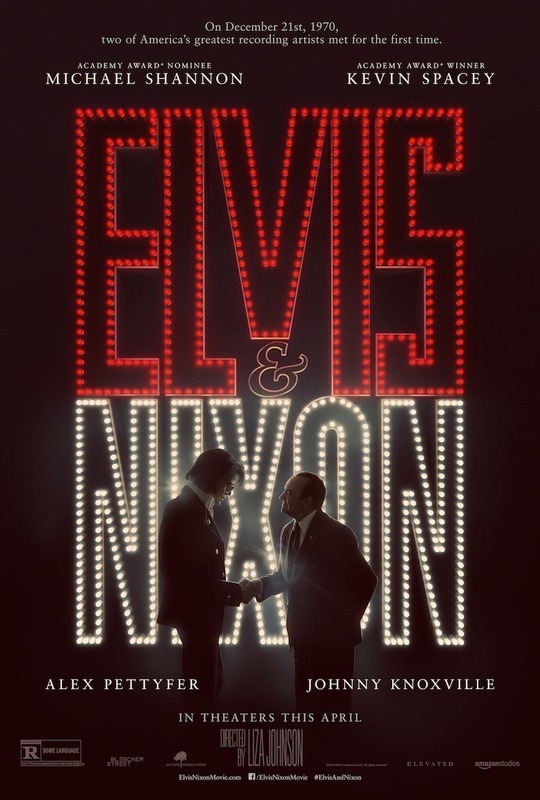 Based on an actual encounter that took place on December 21, 1970, Elvis & Nixon hilariously re-imagines the unlikely meeting between rocker and politician as dramatized by two of America’s finest actors.